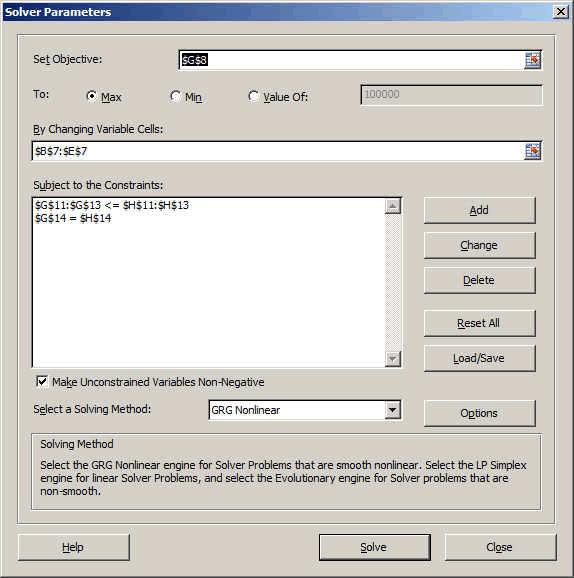 The Solver is the Excel tool that helps you find numerical solutions to various problems or mathematical function you might want to solve. It is not loaded per default in Excel so you have to load it first. It is a so called Add-in. 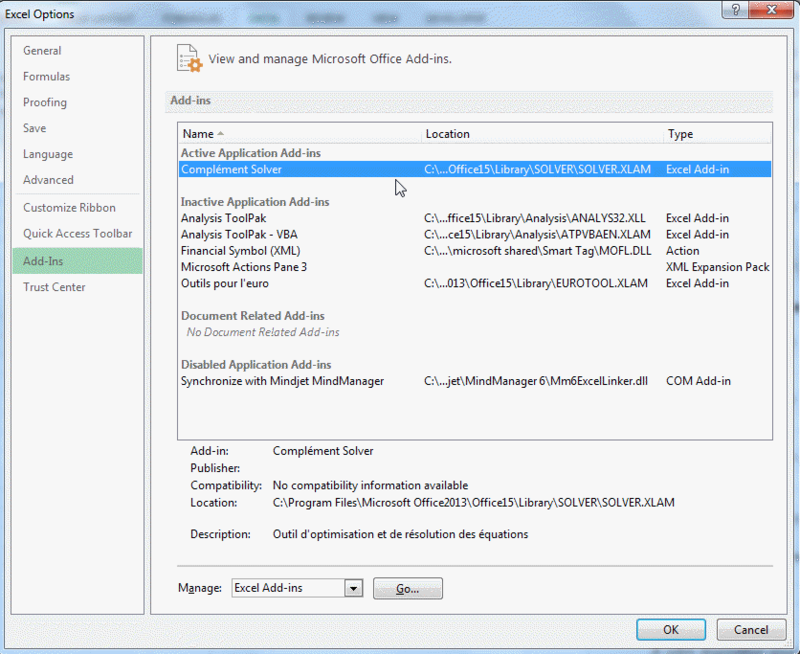 The following window will open for Excel but the solver could be called Solver Add-in or complement Solver depending on which version of Excel you are in. Select the solver then OK. This will create a new icon in the DATA Banner. It is located at the far right of the banner. We have harvested 13542 apples in 2014. Now we want to sell them on various markets. We have for this purpose prepared some nice baskets with ribbon and flowers. These will give more value to our apples as they will become Presents. But of course making the baskets and adding the flowers and ribbons cost money. So we calculated these costs and the profit we get for each basket sold. The profit is different for each basket and we only have a limited budget of ribbon, baskets and flowers. We want to know what the optimum quantity of each basket will be in order to make have the maximum profit (because we worked very hard). Look at the following table. We have four (4) different sets or packs. You can see the profit for each Set and underneath, you can see the costs of the basket, flowers and ribbon as well as the number of apples in each basket. 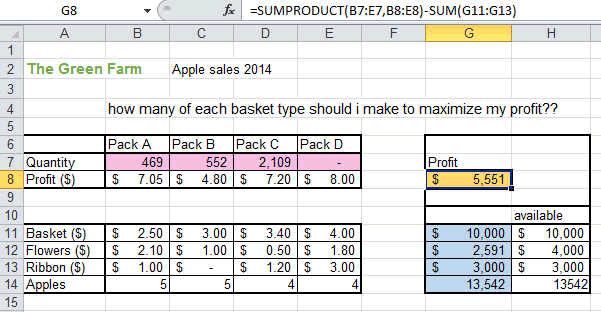 The profit is using the SUMPRODUCTfunction. You can see on top of the picture. It is the profit x the quantity for each Pack. What are you looking to maximize, minimize or find. In our case it is the profit we want to maximize. So we press on the right side of the SET OBJECTIVES window and select the profit cell (orange cell). Next we need to tell Excel which cells he can play with (or lets say he should adjust) to change this profit. These are the quantity cells (pink in the table). And finally, we have to tell Excel what are the boundaries or limits or constraints he has to play with. 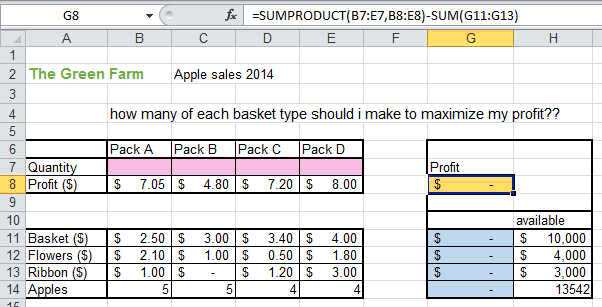 If he had NO LIMITS, NO BOUNDARIES, NO CONSTRAINTS, then Excel would just take the simplest answer which is the maximum profit Set In our case it would be the PACK D.
But if you set limits in the price of baskets for example, then obliges/forces Excel to use the less expensive sets too. and most important it should use all the apples. Now that you have set the boundaries, press solve and the result appears after some short calculation by Excel. Here we are, we will make a profit of $5'551 and use all the baskets and ribbon money but we will use only $2'591 out of the $4'000 budget we had for flowers. 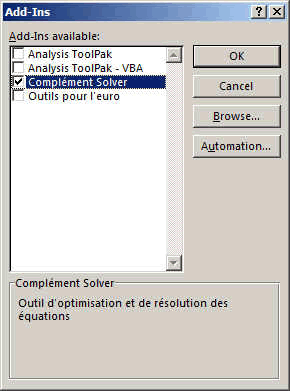 So that's it for the SOLVER in Excel.